Back in stock. 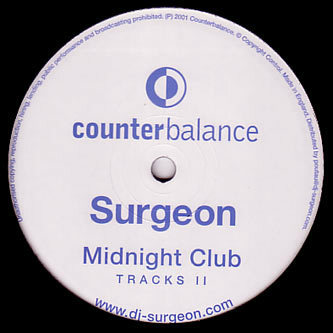 Three utterly classic tracks from Surgeon on the 2nd in the Midnight Club Tracks series, a deeper excursion that centre around the ultra filtered opener which deploys an addictive riff played on superbly modelled noises, backed by a crisp and crunchy techno underlay. With Surgeon hitting the filters hard, check the last cut on the flipside, a relentlessly awesome track that heads off with clanging percussion and tight drum grooves, a couple of synth lines leak into the percussive vibe, and the main line sounds like an old Rhythim is Rhythim hook that's toughened up to deal with Surgeon's beats. A rolling almost melodic cut, mighty stuff once again.